She's a good foot shorter than anyone else on the team and is usually yelling at her teammates. What can she possibly be adding to her boat's success? She's the coxswain, and her role is invaluable. The coxswain is each boat's conduit between the rowers and the officials on the course. Before the regatta, there is a meeting between the officials, coxswains, and coaches. This meeting is used to go over course safety, rules of racing, traffic patterns on the course, emergency procedures, start times, and any other information they deem relevant to the regatta. Once it's time to race, each coxswain is responsible for making sure her team is ready and her boat is lined up for the start. She will raise her hand to let the officials know her boat is ready. If any boat is called for a penalty at this point, the coxswain raises her hand to communicate that her boat acknowledges the penalty. The coxswain typically sits in the stern of the boat, facing all of her rowers (unless the crew is racing a bowloader). Unlike the sliding seats that rowers sit on, the coxswain sits on a secured seat partially enclosed in the hull of the shell. Rules state that the opening through which the coxswain enters must be at least 2.3 feet long measured along the longitudinal axis of the boat. It must also be as wide as the inner hull of the boat. Finally, the inner surface where the coxswain sits in the boat must be smooth and free of any obstacles, to allow for a quick exit. Rowers sit facing the opposite direction of the coxswain, meaning their backs are turned on the course for the entirety of the race. This means that the coxswain is the eyes of her whole crew. She's in charge of steering around any obstacles, maintaining a safe distance between other crews, and navigating turns on the course. The coxswain also has to be aware of how wind or the current might play a role in her boat's movement during the regatta. There are a few way the coxswain can steer the boat. The first is by using the rudder under the shell. This is the small fin she can move back and forth to change the direction of her boat without making her crew do anything differently. However, because this has the potential to invite instability into the boat for any move that isn't minor, many coxswains will tell their crews to pull differently. That might mean yelling for the starboards to amp up the pressure for 10 strokes to make a slight bend in the river. For big changes in movement, the coxswain could use both the rudder and call for one side of the boat to pull harder until the boat is moving in the correct trajectory. This one is huge. The crew's coach obviously isn't communicating with them during the race, so it's the coxswain's responsibility to coach them out on the water. To do this, the coxswain has a cox box. This amplifies her voice using speakers places throughout the boat, so all of her rowers can hear what she's calling. The cox box also tells the coxswain what the crew's stroke rate is, gives their 500 meter split times, and automatically starts a stopwatch at the first full stroke of the race. This gives the coxswain vital information she needs to know to coach her team to the finish line. While the crew will go into each race with a strategy, it's the coxswain's job to keep them on track to meet their race goals, as well as make any tactical changes throughout the race. Using information from the cox box, she will call for the rowers to increase or decrease their stroke rate. She can tell the rowers their splits, and get a sense of the splits in the boats around them. If a crew is losing steam, the coxswain might yell for a power 10, or 10 strokes at full power to put a jolt in the boat and send her crew streaming forward. 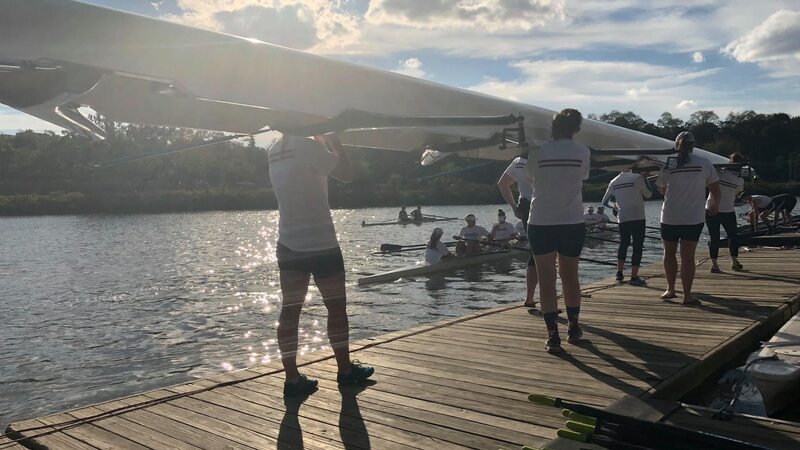 Since she's the only one with a full view of the boat, the coxswain will also let her crew know if they are not exactly in sync with one another, and coach individual rowers back into the perfect swing of the boat. Beyond making tactical judgements, the coxswain is there to encourage her crew. She can see the pain of racing on their faces and knows when they're getting tired. The coxswain is a constant voice of reassurance to her rowers, pushing them forward when they feel like they want to give up. Once the race is over, the coxswain will once again be in charge of any on-water communication with the officials. She will then direct her crew how to get back to the docks, in what order they'll take their boat out of the water behind other crews, and take them back to the crew's tent where the coaches are waiting. So, the coxswain isn't just the one who goes around yelling at her teammates. She's a major source of knowledge and encouragement in the regatta.